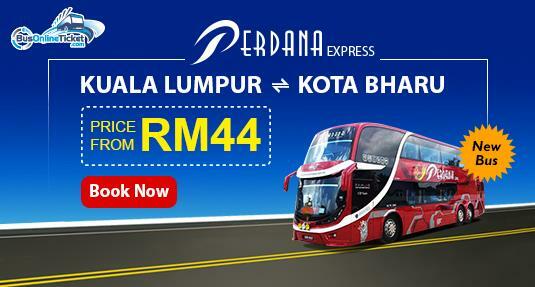 Perdana Express has now joined BusOnlineTicket.com to offer online booking for their bus tickets. Being one of the major bus operators in Malaysia, Perdana Express have good reputation among Malaysian travelers. They are famous for their comprehensive bus service going to and coming back from Kelantan from many different states in Malaysia. One of the famous routes is bus from Kuala Lumpur to Kota Bharu and bus from Kota Bharu to Kuala Lumpur. Perdana Express offers 10 bus trips daily starting from 9:45AM to 10:45PM for this route. Hence, passengers can conveniently choose the time that is suitable with them for their journey. The fare for this trip is from RM44. The departure and drop off point in Kuala Lumpur is at the Terminal Bersepadu Selatan (TBS). Meanwhile, for Kota Bharu is at the Kota Bharu Bus Terminal. Other than routes serving majority locals, they also supplies bus service from Kuala Lumpur to Kuala Besut and from Kuala Besut to Kuala Lumpur. Because Kuala Besut is a gateway town to Perhentian Island, many foreigners travel with them to Kuala Besut before transferring ferry to the paradise island for vacation. Besides quality service, many recommend Perdana Express for their punctuality. Apart from that, the buses are spacious and have with air conditioning to ensure a comfortable journey. They are all double decked with 45 seats arranged in 2+1 seating arrangement. The popularity of this bus operator is one of the reason why Perdana Express bus tickets are usually selling fast nearing public holidays. Besides bus service to Kota Bharu, they also provide bus services covering other areas in Kelantan like Pasir Mas, Machang and Rantau Panjang. Check the schedule, plan your trip and book your Perdana Express bus tickets with BusOnlineTicket.com now!